LiveShadow aims to provide CISO with a compilation of all the critical incidents that are taking place at the moment as well as realtime highlights of the critical events detected recently. LiveShadow also provides an intuitive system health summary which CISO can easily refer to in order to understand the overall security situation of the environment. 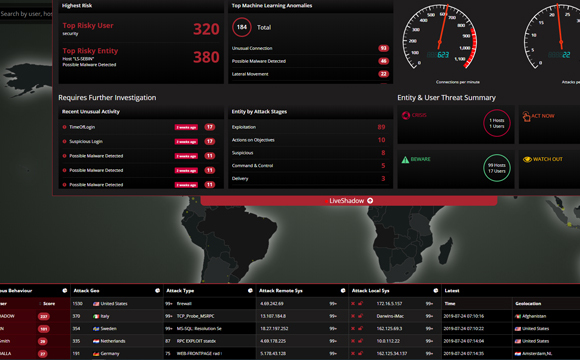 There are three main sections in the LiveShadow screen; Critical Findings which lists the most risky users and entities detected by the system as well as top machine learning anomalies identified, Realtime Connections which shows number of connections along with number of attacks in realtime view, and Entity and User threat summary which lists the most recent anomalies detected as well as a collective summary of users and entities in the ThreatScore Quadrant. Clicking on any of the widgets in the LiveShadow screen will navigate to the relevant window showing more information about the user or entity that caused the anomaly.